These accessories for acrylic painting include both essential items you'll need for painting with acrylics, as well as a few non-essential items that you might want to experiment with. For instance, most surfaces need to be primed with gesso, and finished paintings need to be protected from the elements with varnish, so these supplies are considered "essential". I'll also tell you about different tools you can use to apply paint and special palettes designed to stop acrylics from drying out - these items are "non-essential" but they might come in handy! 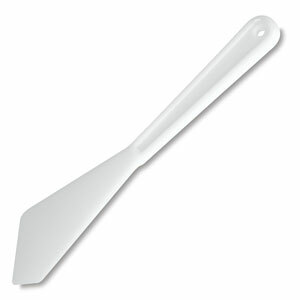 We're going to cover Primer/Gesso, Varnish, Palettes, Palette and Painting Knives, and Paint Shapers. Primer - a type of "ground" - is just a special paint that you apply to a raw surface to make it more suitable and receptive to acrylic paint. It dries hard but is still flexible. Acrylics are so versatile that you can paint on most surfaces without priming, which is not so with other media like oils. But in most cases I would recommend priming because it provides a more receptive support that facilitates paint flow, feels good to the brush, and allows you to tailor the surface to your liking (smooth or textured). Primer also helps acrylic paint adhere to the surface by making it more absorbent and by providing tooth for the paint to grip. Acrylic primer is often called "gesso" which is technically a misnomer because traditional gesso is made from animal glue and chalk (which is not the case for modern acrylic primer). But "gesso" has become a common term for acrylic primer (even by manufacturers), so on this site I'll also use the terms primer and gesso interchangeably. 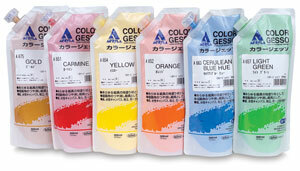 Gesso is usually white, but comes in a variety of colors and can also be tinted by mixing in some paint. White primer is suited to artists who like to use a bright undercoat that can heighten other colors and even shine through to give a luminous effect. Colored gesso is handy for artists who like painting on toned ground to create different effects. These days you can buy canvas and boards that are pre-primed. This is a great option for beginners, but as you get more experienced you come to know how much gesso you like on your supports. You may buy a pre-primed canvas but decide to apply a few more layers of gesso because you felt it lacked tooth or absorbency. The type of gesso you use and the number of layers you apply comes down to personal preference, something you'll develop over time. 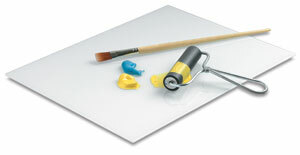 Acrylic gesso comes in two grades: artists' grade and students' grade. 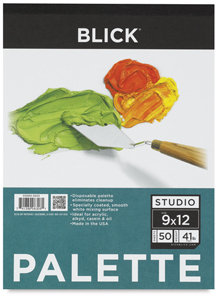 Artists' grade is more expensive because it has a higher pigment to filler ratio. Acrylic primer comes in jars, tubes, squeeze bottles and even spray cans. You can also buy it in a variety of consistencies: liquid gesso leaves a smooth surface, thicker gesso gives you a more textured surface (more tooth), and you can even buy super heavy gesso which allows you to create sculptural effects with a palette knife. In oil painting it's necessary to "size" the support by applying a thin coat of glue size before you apply the priming coat. This is NOT necessary when using acrylic gesso or acrylic paints. You can use acrylic primer in a number of ways to create different effects and textures. But if you're just starting out, don't worry; the main idea is pretty simple. Just start out with pre-primed supports and buy a decent primer in a jar (which can be thinned if needed) and experiment! For more info on how to use acrylic gesso visit my What is Gesso? page. 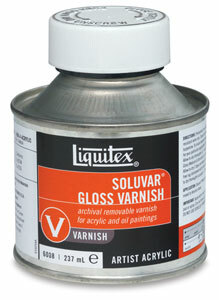 Varnish is an important tool in preserving your artwork for years to come! Varnish is a liquid (sometimes mixed with water) you apply to a finished painting that dries to provide a protective coating. Acrylics dry hard and waterproof and are much more durable than oils, but you should still varnish finished acrylic paintings because it will protect them from dust, ultraviolet rays, humidity, scuffing and yellowing. Varnish can also give your painting a certain aesthetic appeal by evening out differences in gloss and enhancing the vibrancy of the colors. 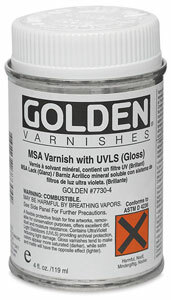 You can buy varnish in three main types: gloss, matte and satin. What you choose depends on the look you're after. Some people like a glossy surface that revives dull colors, while others find glossiness distracting. A matte varnish will give a nonreflective finish and tone down a particularly glaring color scheme. Satin will give you something in between. Alternatively, you can mix gloss and matte varnish to achieve a satin, semi-gloss finish. With experimentation you'll discover what you prefer. 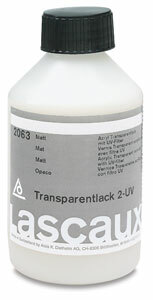 Acrylic varnish is also available in two different formulations: resin and polymer. Acrylic resin varnish supposedly creates a better high gloss finish, but I prefer acrylic polymer varnish because it's non-toxic and can be diluted with water, which means you don't need any foul-smelling chemicals to clean-up. I recommend you buy a removable varnish just in case you (or maybe an art museum curator) need to remove the varnish with a solvent if the painting needs cleaning or the varnish itself has become stained somehow. Some say that gloss or matte mediums can be used as varnish. I advise against this because these mediums won't repel dust and dirt like varnish, and they can't be removed. Some manufactuers recommend you apply an "isolation coat" of a gloss medium and water mix before varnishing with matte or satin varnish. I've never done this, partly because I mostly use gloss varnish, and also because gloss medium is not removable. 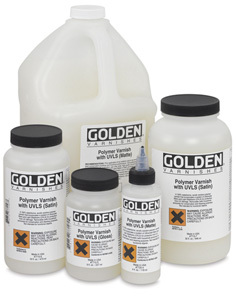 If you're buying for the first time, I use and recommend Golden Acrylic Polymer Varnishes which will reliably protect your painting and won't break the bank. Whichever type you buy, you should follow the instructions on the container because some varnishes, like Golden, need to be diluted with water. Follow this link if you want to learn how to varnish an acrylic painting. It's good idea to designate a suitable brush to use exclusively with varnish. It's an important process that you don't want to mess up by accidentally mixing paint in with the varnish. The same goes for the jar or container you pour the varnish into. Don't use old paint jars - get something for use just with varnish. 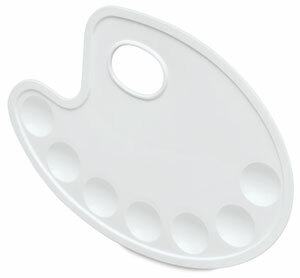 Of all the accessories for acrylic painting, a palette is one thing you'll use every day. Because acrylics are fast drying and permanent, you need to make sure you're using the right palette.You shouldn't use a wooden palette like you can with oils, because acrylic paint will seep into the wood fibers and will be very hard to remove. Whether you're buying or making your own, the best palette surfaces for acrylics are safety glass, plexiglass, plastic, white melamine or paper. For my palette I use a pane of safety glass that sits atop a white piece of paper on my art table. I can't hold it in my hand while I paint, but it's cheap and easy to clean. The other consideration is that acrylics dry fast! So if you're not careful, they'll dry on your palette before you can even get them on the canvas. It's important, therefore, to keep your acrylic paints moist. You can do this by regularly spraying them with water or by using a moist palette. 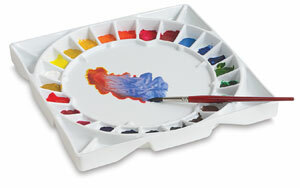 You can buy moist or "stay-wet" palettes, designed specifically for acrylics, or make your own. They keep your paint moist by way of osmosis. 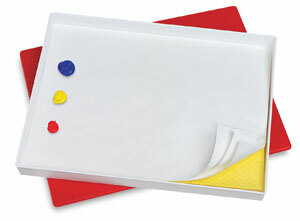 Typically a plastic tray is lined with absorbent paper soaked with water that is then covered by a sheet of membrane paper that holds the paint. For more information on selecting a palette, check out my Artist Palette Guide. 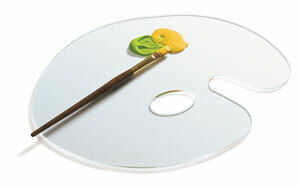 Because acrylics often have a buttery consistency, palette knives and painting knives are useful accessories for acrylic painting when it comes to mixing paint or for applying thick, textured paint directly on the canvas. One famous proponent of knife painting is Bob Ross. 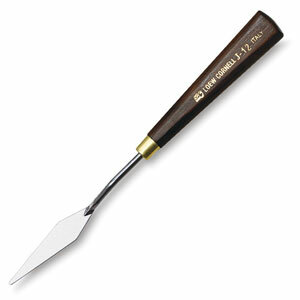 Palette knives are useful for mixing paint and cleaning the palette. Stainless steel palette knives are best because they won't rust. 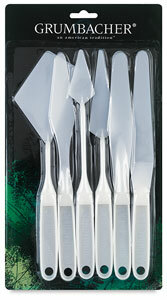 These days you can also buy plastic palette knives, made specifically for acrylics, that are easier to clean. 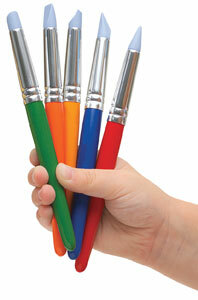 Painting knives come in a range of shapes and sizes that allow you to create a range of marks, strokes and effects. 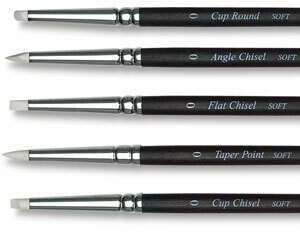 The tips can be used for detailed work, the flat part for broad strokes and the edge for lines. 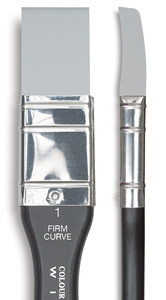 They're not terribly different from palette knives: they should also be made of stainless steel (or plastic) but painting knives have curved handles that make it easier to control the application of paint on the canvas. They're quite inexpensive, so it's easy to experiment which different shapes and sizes. When you make a purchase via the links below we receive a small commission (at no cost to you), that helps keep this site running! 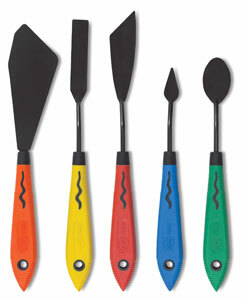 Paint shapers, also known as color shapers, are a recent innovation. They're kind of halfway between paintbrushes and painting knives. They look like paintbrushes with wooden handles and metal ferrules, but in place of bristles is a rubber tip that comes in a range of shapes and sizes. 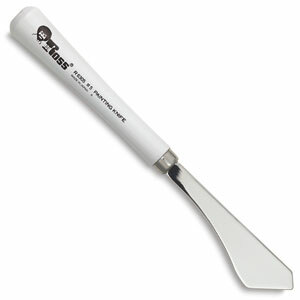 The tip can be either hard or soft and manipulates paint straight from the tube more like a knife than a brush. They're compatible with all types of media, not just acrylics, and they're easy to clean. I haven't yet used them in my art, but I'm looking forward to experimenting. You can check out more art supplies for acrylics and other media via the guide to buying art supplies.